Nemo’s War is a single-player game of underwater exploration and combat circa 1870. You are Captain Nemo, commander of the Nautilus. You will search the oceans, right vessels of all nations, brave the hazards of the seas, and mysterious treasures, behold and chronicle amazing wonders, and travel around the world in your quest for knowledge and vengeance. Nemo’s War is based on the novel 20,000 Leagues Under the Seas by Jules Verne. This variant allows 2 to 4 players to sail cooperatively and work together for a successful voyage on the Nautilus. In the solo game you are Captain Nemo; in the co-op game, you are always a vital ship’s officer but will also alternate taking the lead as the Captain. I’ve never ever experienced a game which is so thematic. NW is a true masterwork and I’m so happy I pledged it on Kickstarter. I don’t care if and when I lose: it just means experience and tactics learning for next games. Playing a game to NW is always exciting. You’ll roll dice betting on your own resources, event cards will influence your journey, you’ll sink ships ramming into them. Sometimes, pure misfortune (a dice roll, an event card) will make you fail your mission: this could be frustrating but – come on! – every imperialist country will be hunting your Nautilus! To me, the only flaws are the plastic inserts, which can be just thrown away and the miniature, which deserved to be produced in metal. 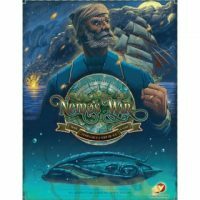 Add a Review for "Nemo’s War 2nd edition"